Bays and Bows are more than just windows. They are combinations of windows that reach out into the world and capture the view. Even with limited wall space, a bay or bow window allows you to have more windows and more view—in a limited amount of space. Consist of four or more casement windows joined together to form a graceful curve. Choose windows with fixed glass (cannot be opened), or have two or more—even all—of the windows vented (can be opened). Pella® bay and bow windows are a combination of windows that allow you to have more window and more view. Even with limited wall space. Bay windows typically consist of three windows joined together. The center of the window is usually fixed (cannot be opened) with your choice of operating double-hung or casement windows at the sides. Bow windows consist of four or more casement windows joined together to form a graceful curve. Choose windows with a fixed sash, or have any combination with vented (can be opened) windows. Many Pella windows come ready to be installed—so no extra time is needed for assembly. Choose from a variety of options, including plywood headboards and insulated seat boards. Bay and bow units are configured using Architect Series®, Designer Series®, or ProLine®brands. 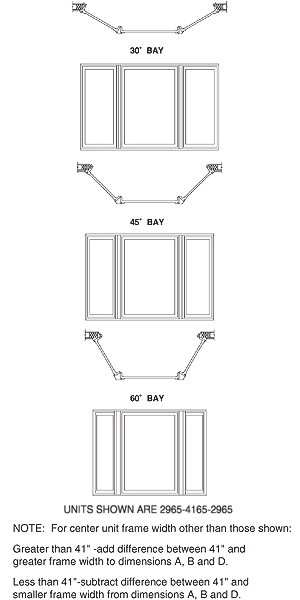 Architect Series and Designer Series bay windows are available in 30 degree and 45 minute angles. Other custom angles are available. Architect Series and Designer Series bow windows are available in 12 degree and 45 minute angles, and can have four or more units. Custom angles are also available. ProLine bay and bow windows are made in 30 and 45 degree angles; they are factory preassembled and ready for site finishing. Aluminum-clad units exterior is protected by Pella EnduraClad® or EnduraClad® Plus fluorocarbon based (Kynar®500)* system. Aluminum jamb covers and head and sill frame expanders are provided to trim bay windows to exterior siding or brick veneer. Can accommodate various roof systems, including soffits and gable roofs. Refer to clad casement and double-hung sections for window unit features. Double-hung windows bring in fresh air from any direction. they're often used in walls adjacent to patios, decks and walkways. channeling breezes from left or right into the home. any direction and are often used above or next to stationary windows to provide ventilation. They can also be placed high on a wall to let light and fresh air into the room while still providing privacy. Stationary rectangle windows are also referred to as picture windows. They are typically combined with venting windows to create large walls of light. Specialty windows are designed to go beyond conventional window boundaries with graceful curves and dramatic angles. They can make a signature statement or provide a delicate lighting accent.